Wireless Access Control – Next big thing? One of the up-and-coming trends in Access Control is wireless access control. 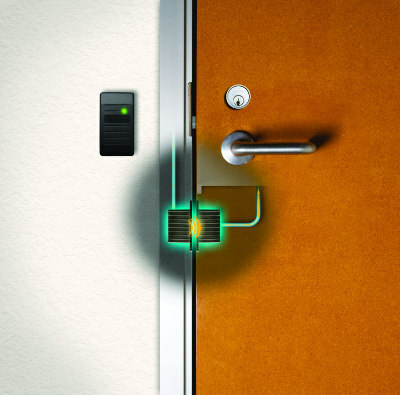 Access control technology is becoming so much more than a card at the door. In an industry survey, the majority (69%) of respondents stated that less than 20% of their access control system installations involved wireless devices; meanwhile a survey of commercial end users saw increased interest expressed in remote (37%) and wireless (36%) access control. This room for expansion, fueled by new and innovative access control technologies, has created exciting engagement in wireless access control applications. Retrofitting high-profile openings with wired access control devices has always been costly and labor intensive. Additional challenges, such as retrofitting a fire-rated door, can be expensive. Today, access control devices need to, at times, be remote and mobile. The popularity of smartphone transactions is also in high demand. New wireless access control technologies can be an appealing alternative for these situations and many more, and solve issues for customers in both the commercial and residential markets. Let’s take a look at some of the latest technologies and offerings that can propel us into the ever-widening world of wireless access control. Wireless access control via smart-phones is very popular. It is convenient to install and integrates well with other Internet of Things smart home devices. Talk to any IT administrator today about the use of their existing IP-based network for security applications and you will hear a resounding “I need my bandwidth.” While this complaint is often directed at bandwidth hogs such as IP video surveillance, the use of access control devices can also be an IP network nuisance. The need to extend existing Ethernet network cabling to remote doors and buildings can be costly. The many wireless technologies available today can help solve these challenges. One can easily be enthralled with the use of wireless access control devices. However, it should be understood from the beginning that whenever possible the practical and cost-effective application of a dedicated point-to-point cabled system will be more reliable and secure than a wireless system. That being said, wireless systems begin to shine as transmission distances increase, and competitive bidding, as often the case, takes priority. Integrators will always face the challenges of labor costs. The cost of trenching between buildings, copper and conduit materials can add up quickly. On the other hand, the cost for Ethernet-based radio transceiver systems can now only be several hundred dollars, making them a very attractive option. Additionally, major cabling projects can cause interruptions in a customer’s daily operations. Everywhere you go it is apparent that most people do not want to be more than a few feet from their personal smartphones. You could say that people have unanimously adopted a new personal electronic identity. This popular concept has not gone unnoticed by the companies that provide mobile access control technologies. The ScanPass mobile credential system from Connected Technologies is a good example of keeping it simple, and still utilizing common features of today’s smartphones. The company has partnered with many major security entities such as DMP, Bosch and Elk. Access locations are identified by easily affixed barcode stickers thereby eliminating access control cards/fobs and readers. A dedicated smartphone application is used to scan the access point ID barcode and then securely communicate for access approval with the retrofitted access control module. The door to today’s home isn’t just about keeping the bad guys out. It’s also about letting the right people in — customers’ family, friends and even service personnel like cleaners or pet-sitters — whenever they designate access and maintaining easy command over the home entrance. A good example of this type of efficient residential wireless access control is the August Smart Lock from August Home. This system not only communicates through its own smart-phone apps but has integrated with such popular products as the Amazon Echo, Nest Cam, and IFTTT (If This Then That) home automation programming tool. One of the nice features is that the Smart Lock device replaces only the interior side of the deadbolt, thereby leaving the existing exterior lock hardware in place. The solution is a great option for demanding millennial customers who want to upgrade to smart home technology.